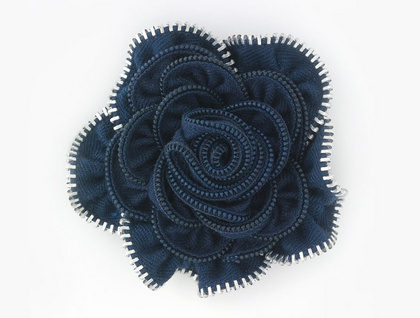 A beautiful Navy rose Brooch fashioned from vintage zips, perfect for someone with a little french Fashion sense. Oh La La. can be converted to a hair slide just ask. Navy Vintage Rose is 6-7cm across at the widest parts.The colour is a dark Navy blue. This flower is made from vintage zips carefully hand sewn together ,The outer petals are made from a zip with silver metal teeth, which adds a jewel like sparkle,It has a brooch pin on the reverse side so you can pin them to your favourite outfits/hat /bag/coat. Just imagine it on your favourite coat or jacket!